Falling Like a Rock is the latest release by author Bonnie McCune. This contemporary romance is set in the mountains of Colorado. Elaine’s life is falling apart. Losing her job, and her boyfriend she stumbles into a refuge in the mountains of Colorado at the home of a college friend. 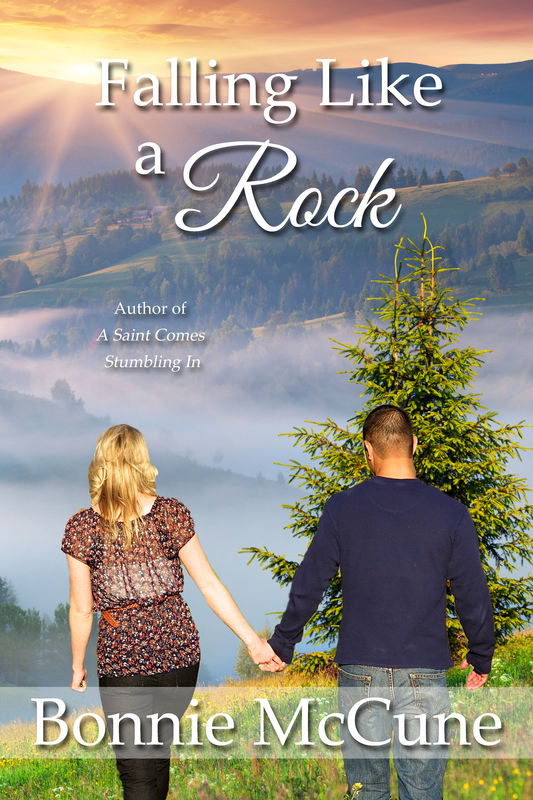 In an effort to pick up the crushed pieces of her life and sagging self-esteem, Elaine finds that life is filled with more challenges when she meets the rugged, hunky Joe, the mayor of Falling Rock. Could Joe help her find a job in the crashing economy of this mountain oasis? Facing her own insecurities as she tries to prove herself in a new town forces Elaine to confront her past as well as her present and future as she learns to take responsibility for her emotions and her life as she repeatedly runs into conflict with Joe, a man she finds attractive and likes but can’t seem to get along with. Falling and breaking her ankle, fighting an eating disturbance and struggling against his stubbornness are nothing compared to battling with the forest fire that burns the chaff away to reveal to both her and Joe their true feelings for each other. Sometimes, surrender is the best choice, when one falls like a rock into love. This is an enjoyable story that takes the reader on a journey into the heart of personal struggles with doubt, self-esteem and body perception issues and the desire to please that can be at the root of sometimes misguided choices. Elaine learns the hard way that the only person she needs to care for and impress–is herself. And out of the ashes of that can come a wealth of blessings. With the character of the mountains of Colorado playing a major role in this story, the reader is transported into the lives and characters of a small town in America where real life, and love, bloom. Previous books authored by Bonnie McCune include: Heart Strong, Irish Episode, and A Saint Comes Stumbling In.